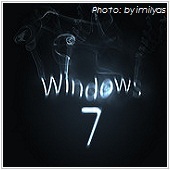 Would you like to customize the Windows 7 Logon Screen and use your own wallpaper image? There are actually several ways to do this. The first method involves editing the registry and creating a folder containing your own custom images. However, if you are uncomfortable doing this, or if it seems like too much work, there is a free application that can do it for you called Windows 7 Logon Background Changer. The download is a zip file, and once you unzip it, just run the installer. After installation, the program will allow you to choose from images already on your drive and view a preview of how it will look. Find out more by downloading the program.